Once upon a time there was a magical place. It was in a land far, far away. And also quite near. It came to be that a hundred thousand brave warrior knights had heard of this magical place. Or forty or so, at least, give or take. They set out on a rather long journey. For some it was far, and for others it was simply near. But even those brave warrior knights (let’s just call them writers, shall we) who came from near understood the metaphorical distance of the journey…the farness of their nearness, as it were. Each year, the marathon raises much needed funds for the literacy programs of YMCA Simcoe/Muskoka. We have a blast, but it’s not all fun. We have an underlying mission that we take most seriously. It was such a grand time that was had by all that they decided to do it again. And again. And again. And again. The event became a yearly festival/spectacle of writerly endurance, wonder, and mirth. This faraway land is known as Huntsville, in the province of Ontario, in the land of Canada. The magical place is not really a place, per se, but an event. Actually, I prefer to think of it as a Spectacular Spectacular. Of sorts. Last year I had the pleasure of reconnecting writerlyishly with M.E. Girard! It’s not always the same people at the marathon, but once you make the trip you’re a part of the #MNM family. Why do I bring this event up today? Because registration is as much a spectacle as the event itself these days. Writers clamor to get in to this thing! With room for only 40 (ish) and rumours of its delightfulness spreading both far and wide (or near and far—as it were), it is getting increasingly difficult for a writer to procure his/her seat at the gala. As in, it is nigh on impossible. And every March, like warriors of old, we stand before our keyboards on the night of registration and wait for the seconds to tick off… and for the virtual gate to open so we can scurry about and type our way into this yearly magical emporium of madness. When the time comes and the gate opens, the Internet feels the tug of love from all points across Ontario as the virtual worms of registration information make their way to the Mother Ship of this Spectacular Spectacular up in the snowy northern outpost of Huntsville. And at the end of registration night, there are virtual bodies scattered on dawn’s highway bleeding… Wait, no… sorry, I somehow channelled Jim Morrison for a second there. No bodies. BUT… there are, both near and far, those ecstatic to be ON THE BUS and those melancholy to have missed it. Yes… I’m talking about the MUSKOKA NOVEL MARATHON again. My skin prickles tonight in the knowing that registration approaches. It is neither near nor far on the horizon. And I want to call myself among the tribe of #MNM2016 participants. I want it, I want it, I want it! Where else in all the world can one writer sit in the same room as 40+ others and do nothing but write for 72hrs? Nowhere. Where else can one take communion with a writing community more vibrant, alive, exhausted, miserable, exuberant, joyful, angry, and insane? Nowhere. Where else can one come together with a group of like-minded people for a cause close and true to all of their hearts? Nowhere. The Muskoka Novel Marathon Fundraiser for literacy in Simcoe Muskoka County is more than a fundraiser to raise money for literacy, and it’s more than the greatest weekend retreat for writers on the globe. It’s a religion and it’s a cult. But don’t tell anyone. We’d have writers coming from… well, coming from near and coming from far to be a part of the worshipping. We’d have to go underground just to exist. That’s how spectacular spectacular our 72hr novel writing (and I swear to God that’s all we do!!) Marathon happens to be. This is why writers begin to lose sleep through February and early March. 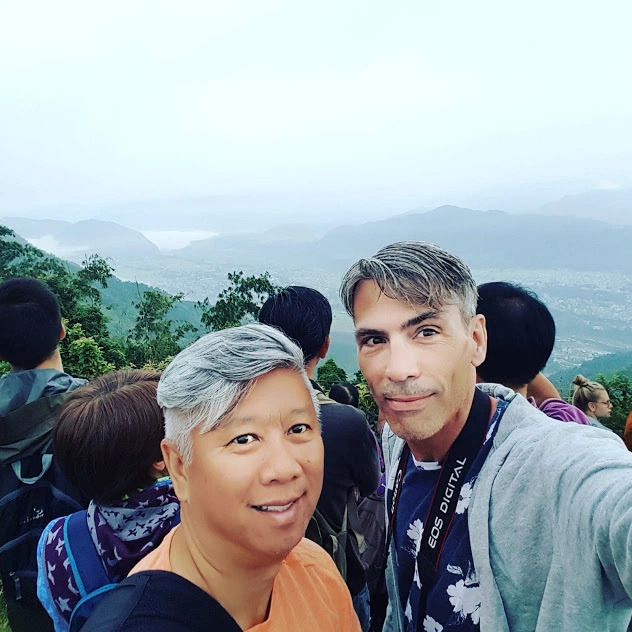 They imagine themselves not registering in time, not securing one of the coveted spots at the July Marathon, not being a part of the most magical writing weekend of the year. And they spend their time at their keyboards, fingers at the ready… Awaiting the opening bells of the registration melee that opens the chaotic yearly ritual. We want to be there. We want to be fierce warriors against illiteracy and we want a weekend of writing bliss. Whether we come from near or far… We just want a seat at the table. The journey to the Muskoka Novel Marathon… it’s all about words. Check out the MUSKOKA NOVEL MARATHON WEBSITE! For the past few years Sue Kenney has been giving writers the gift of her “WALK FOR CREATIVITY” to allow us a reprieve to connect with nature, barefoot. It’s such a welcome part of the amazing weekend! Eeek! My foot is in your blog! I’m famous -ish. So glad I got a pedicure before I went to the Marathon . . . .
Haha! The feet of tomorrow’s literati! I remember hearing about this mythical Valhalla (well, except we don’t have to be dead to go there) for writers from you and others at the WCDR for a few years. Each year I would think “I should sign up for this”, and each year I would talk myself out of it because a little voice would say “oh, you couldn’t – you’re not a ‘real’ writer anymore”. 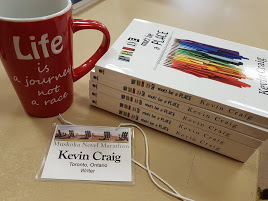 But that experience was nothing compared to actually BEING at the Muskoka Novel Marathon – one of the most fulfilling, empowering, fun experiences I’ve ever had, and not just because of the writing aspect. Seeing how much money we raised there, and finding out the final total on that rainy day in September (and bragging about it to my supporters afterwards) was wonderful. I’m hooked now, both on the fundraising and the writing – can’t wait for this year! You summed it up nicely. The fear, the expectation, the fundraising excitement, and the ACTUAL being there. Can’t wait to do it again! See you there.